Yesterways WiseCraft Wicca: Could your psychic attacker be....YOU? The illness that had plagued me is finally at bay. Sad to say, I did end up seeking medical help. I had bronchitis and my cough became so hard that my ribs paid dearly. I could not move without sending myself into horrible spasms of pain. No amount of ice or heating pad nor over the counter anti-inflammatories or essential oil lineaments would provide relief. It was with much shame as a healer that I conceded to go to the emergency room for treatment. I always believe is self healing first and allowing the body to try to master its ills on its own as it was designed to do. But every great now and again, I get bowled over and have to begrudgingly allow conventional medicine a place in my life. I must say I truly feel the better for it. I took all the antibiotics for the bronchitis and used the prescription anti-inflammatory only initially to help curb the pain so that I could rest peacefully. Now, the key will be to get back on top of my essential oil regimen so that I don't fall pray to such illness again. Imbolc was today but I had no time to do ritual. I left home before dawn and traveled more than an hour to be with my grandchildren for the day. Though it is a narrow road through the country with no cellphone signal, the long miles passage through the dark morning hours went well. I arrived timely for my daughter to walk across the street to her work (what a lucky commute), I crawled into bed with my tiny tot grandson and snuggled down for an hour more of rest. What a great surprise it was to awaken and find not only the light of day but the white of snow! I should pay far more attention to the weather as a Witch than I have done. The snow came on fast and hard and swallowed the land in a sea of white. Knowing that I was far from home and the roads that would take me home are hilly, narrow, winding, treacherous and unforgiving I had a bit of a panic. So, back up plans for the day were made and my journey home began much earlier than originally planned. Only the weather, roads and very cautious drivers ruled the trip. I followed behind a big rig for never ending miles and he barely traveled 30 miles per hour. Trailing behind him was such a bluster of snow that would white out my windshield so I had no choice but to hang back and travel slower than he -- so I found myself traveling barely 20 miles per hour. I feared at times that I would not be able to gain the necessary speed to make the hills but my trusty van accommodated me nicely, thank goodness. After far longer than normal, I made it home. The snow easily mounted to 6 or more inches. I was quite surprised. I had expected mere *spitting* of snow flurries. Shame on me. Weary from rising before dawn three days in a row and troubled nights of little sleep, exhaustion caught up with me and when home at last I went straight to bed. Now, when I should be sleeping, I am fully rested and lying awake in my bed banging away at my computer writing this post. Life is truly funny this way. And so my Imbolc was spent in whiteness of winter with a cold promise of spring sometime in the future. I haven't taken the time to see what the Ground Hog predicted. If our weather mattered, there was no sun for shadows. However, my husband indicated that it was sunny for the Ground Hog. My question is, who said that particular Ground Hog has rule of the weather in my part of the world...? I will ponder this more another time. Now I will jump off the computer and lie still for a while and see if sleep will claim me. Wow! Has it really been August 2013 since I posted? Well, golly gee and shame on me! But I am back now. This winter has had me a bit kicked with a cold. First I ached all over, not nauseated or nasty iggies like that but just all around aching and a strong desire to lay still so it didn't hurt. Probably not the best plan since I am still struggling with the shoulder injury. Inactivity with the shoulder is a guaranteed set back on its progress and that means a painful push to get back on track. So, definitely don't want to go back there. Well, the achiness passed and then lo and behold, along came stuffed up ears but no cough. With a stuffed up nose, I had to breathe through my mouth and that unfortunately meant really dry parched tonsils the next morning which are actually beyond huge anyway. So, fast forward to get out of that stage we actually have coughing now, a dry cough. Ugh! But lots of coughing and a deep down feeling that my bronchials needed to purge but they were just too tight to be productive. Now that brings in SORE RIBS. Egads! Seems never ending. LOL By now I sound like quite the whiner and I have to laugh at myself, that is, if laughing wasn't so painful to the ribs. As a short aside, I actually did have a laughing spasm today that was debilitatingly painful but I couldn't help myself. I was literally in histeria with tears flowing. The kind of deep, shaking all over, toss the head back and throaty laugh that leaves your belly shaking and RIBS, and you can barely breathe, but you catch your breath and go at it again. You know the sort of laugh I mean? And contagious too because I had my British friend getting caught up in the giggles to spite himself. What was it all about? A GoDaddy commerical with Jean Claude Van Damme. Oh if you haven't seen it, then it is time that you should! Here's the subject video so you can see for yourself what all the fuss was about. Now that I have that little mess out of the way, let's get to some serious conversation. So, as I gushed on about being so miserably ill for a while now, it had to cross your mind, "well I thought she was some sort of energy healer and all that, so what is she doing being all sickly if she can do healing?" That's a very good question and I discussed that very thing with my Earth Spirit Soul business partner Sol Ess. We pondered why is it that healers will do great wonders for others and then fail so miserably for themselves. He and I came up with a few ideas. First off, it comes natural to do healing on other people and we give it our all. We both agreed that it was instinctual. However, for whatever the reason, he was the same as I was in admitting that when we feel sick ourselves, we don't even think of doing the healing on ourselves. Now how crazy is that? It was quite a realization really. I have to wonder if it is because as we feel bad, we get caught up in feeling bad and just sort of loose touch with things. I know as a young teen and early 20s and later as a young mother, I simply didn't tolerate illness. I had the attitude that I just didn't have time for it. And I truly didn't have time to be ill and I pushed through any illness with minimal effect. Somehow, I beat it down in such early stages that I barely could recognize that it had been upon me. So, why would it be different for me now? Well, I figure age plays some part in it. I am guessing that as I have aged and entered menopause that my immunity system has slowed down considerably. It reminds me of ages 6 to 8 when I moved from one state to another and was suddenly besieged by every possible childhood illness practically back to back. After that, my immunity system was so strong that as a grown woman, it took 8 years for me to become pregnant. After a series of tests, they determined my immune system was attacking and stopping fertilization. Bizarre. And now it feels like here I am in a second child hood getting slammed with all this illness back to back again. Ugh! Not liking that at all, not one bit. Anyway, after the talk with Sol today, I vowed to break out my fierce attitude and declare war on my illness and let it know that it isn't welcome in my body anymore. It's reign of terror is over. I will be running energy on myself and treating me like any other client and breaking out all the big guns on healing. Let's see how quickly this dissipates after me struggling with it these past several weeks. I sincerely hope the New Year is finding every one happy and healthy. Amethyst is one of my all time favorite crystals and thankfully it is very universal in nature. It is a purple quartz crystal that was thought by the Romans to provide protection from drunkeness. This powerful crystal helps provide calm, balance, patience and peace. As if these qualities alone aren't powerful enough, Amethyst also enhances spirituality, intuition and psychic abilities. It does this by making a clear connection between the earth plane and other planes and worlds. 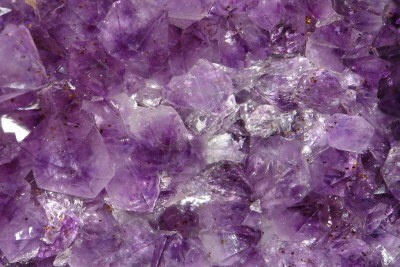 Amethyst is also excellent for meditation and lucid dreaming. It is used to open one's channels to telepathy, past life regression, clairaudience, clairvoyance, and communication with angels. Amethyst also protects against psychic attacks, especially during spiritual work. This is truly just a tip of the iceberg of the many helpful purposes of using the Amethyst. Watch for our crystal healing course coming soon. Earth Spirit Soul Learning Center has arrived! I'm so excited! Remember I told you good things were coming? Well, Earth Spirit Soul Learning Center has arrived! It is a self-paced online classes in psychic skills, reiki, meditation, chakras, auras, energy healing, and more! Become a member and let us assist you on your journey to self enlightenment and greater understanding at a reasonable cost in the convenience of your own home. And what's even better, you get it ALL for a one time lifetime membership fee of $99 US. In addition to being a Psychic, Energy Healer etc., as with many people, my interests are wide and varied. Tonight, I was digging around on YouTube and low and behold, I found the documentary video called Lords of Stroud which featured a gaming group that I participated in. It was quite fun run across this again and to remember the good old days. I am the Mage with the wild black hair wearing a leather vest and carrying a staff. This event was very loosely scripted and flowed according to the choices made by the children (one of which is my daughter by the way). When the children got to me, I would either be their ally if they were friendly and help them seek the beast, or if they were hostile, then I would be a formidable enemy. They chose to call me friend and I assisted them in finding the beast they sought. Copyright 2012 by Rayven Michaels. Powered by Blogger.